Wash cucumbers and slice into 1/8-inch-thick slices. 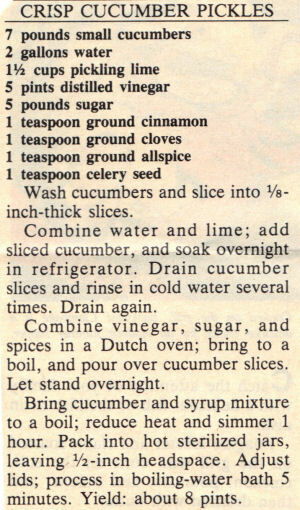 Combine water and lime; add sliced cucumber, and soak overnight in refrigerator. Drain cucumber slices and rinse in cold water several times. Drain again. Combine vinegar, sugar, and spices in a Dutch oven; bring to a boil, and pour over cucumber slices. Let stand overnight. Bring cucumber and syrup mixture to a boil; reduce heat and simmer 1 hour. Pack into hot sterilized jars, leaving 1/2-inch headspace. Adjust lids; process in boiling-water bath 5 minutes. Yield: about 8 pints.